European kitchen decor. Transform your space with colorful pieces you'll look forward to using. Transform your kitchen with European flair. Colorful new rugs and tapestries can add color and charm. Holds up to eight mugs Cotton Crafted from subtly striped terracotta with a reactive glaze, these versatile bowls can be used for mixing ingredients or serving your favorite snacks. Bright and bold "Homestead Rooster" red and white ceramic serveware by Certified International features four assorted proud roosters, designed by Susan Winget. Coordinating solid red glazed embossed accent pieces and a colorful 3-d rooster complete this mix and match collection. Bright and bold "Homestead Rooster" red and white ceramic dinnerware and serveware by Certified International feature four assorted proud roosters, designed by Susan Winget. Coordinating solid red glazed embossed accent pieces and a colorful 3-d rooster ceramic cookie jar and salt and pepper set complete this mix and match collection. Bright and bold "Homestead Rooster" red and white ceramic dinnerware and serveware by Certified International feature four assorted proud roosters, designed by Susan Winget. Coordinating solid red glazed embossed accent pieces and a colorful 3-d rooster ceramic cookie jar and salt and pepper set complete this mix and match collection. For British artist Kate Jenkins, bangers & mash, shrimp cocktails, and ice cream cones are more than tasty treats - they're subjects to render, with astonishing verisimilitude, in three-dimensional knits. From her fiber-filled studio in Brighton, she reimagines comfort cuisine as woolen wonders stitched with a sense of whimsy and wit. Handcrafted patchwork pot holder. Handcrafted patchwork cotton oven mitt. The charm of a basket meets the elegance of porcelain in these textured white canisters from Martha Stewart Collection. Greet friends old and new alike with a batch of warm, home-baked treats inside our Cookie Jar with Flower Market Enamel Lid. The glass body offers a preview of the tasty goodness in store, and the lid is color-glazed and hand decorated with fanciful botanical transfers that recall a lush English garden in the peak of summer. Equally suited to hold cotton balls on the bathroom counter, clothespins in the laundry, or cookies for your four-legged friends, you'll find yourself inventing uses just to incorporate the subtle splash of garden-fresh color into every room Beautifully fluted porcelain topped with stylishly tailored wood creates Hotel Collection's canister set that will be at home on any countertop. Cotton Cotton A gilded rabbit brings a touch of metallic shine to this delightful dish towel - it's designed by Bespoke Letterpress in collaboration with Anthropologie. Marble kitchen storage canisters. Handcrafted pewter pitcher. 9"W (including handle). Made in Italy. Handcrafted cookie jar. Lid with dog finial. Pewter and ceramic. Handmade in Italy. Designed by Dear Hancock in collaboration with Anthropologie, this charming dish towel brings a touch of playfulness to your kitchen. Designed by Libby VanderPloeg in collaboration with Anthropologie, this charming baking set is an ideal gift for your favorite dog lover. Designed by Dylan Mierzwinski in collaboration with Anthropologie, this charming dish towel is sure to make anyone smile. Cheerful and bright, this hand painted utensil holder from Lorren Home Trends makes a delightful and fun addition to any kitchen. The whimsical chef balancing a tray of food is a fun way to decorate while the black and white checker bottom adds a stylish and finished look to this collection. This utensil holder set includes 4 utensils. Cheerful and bright, this hand painted condiment set in rod iron stand from Lorren Home Trends makes a delightful and fun addition to any kitchen. The whimsical chef balancing a tray of food is a fun way to decorate while the black and white checker bottom adds a stylish and finished look to this collection. 5 piece set includes: oil, vinegar, salt, pepper and a clever caddy that has a napkin holder compartment. Cheerful and bright, this hand painted cookie jar from Lorren Home Trends makes a delightful and fun addition to any kitchen. The whimsical chef balancing a tray of food is a fun way to decorate while the black and white checker bottom adds a stylish and finished look to this collection. Gasket lined lid for food safety and fully glazed interior finish. A new Bordallo Pinheiro collection of naturalistic tableware and giftware that perpetuates and reinvents the legacy of the brand's founder, bringing nature, humor and joy to the table. Naturalistic theme, both in texture and in organic form. Hand-painted pieces, each piece being unique. Handcrafted artichoke box. Hand-painted earthenware. Mushrooms are a perfect example on how the creative nonconformity and functionality do not exclude themselves. We continued the artist's work, creating pieces where nature, humor and joy are served at the table. Hand-painted earthenware. Dishwasher and microwave safe. Made in Portugal. Handcrafted pimento boxes. Hand-painted earthenware. Dishwasher and microwave safe. Made in Portugal. Inspired by a lush European countryside, this collection showcases an enchanting floral pattern. This tea towel is digitally printed in rich colors on 100% cotton and wash to give the fabric great texture. Travel to sunny Italy with Certified International's Piazzette ceramic collection designed by Julie Paton. Beautiful watercolor scenes of Italian town squares and veggies decorate each item. This 3-d Villa House Cookie Jar would be a charming addition to any table. Inspired by a lush European countryside, this collection showcases an enchanting floral pattern. This apron is digitally printed in rich colors on 100% cotton and washed to give the fabric great texture. 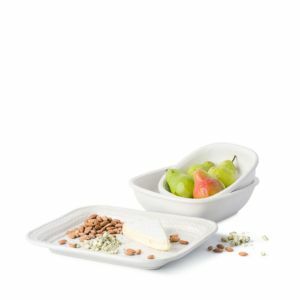 Set includes: 9" serving bowl, 11" serving bowl, 14.5" platter. Ceramic stoneware. 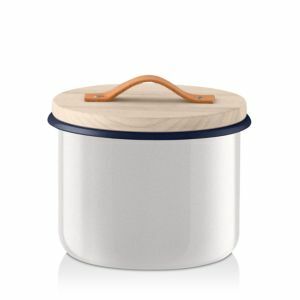 Dishwasher, microwave, freezer and oven safe. Made in Portugal The chic hammered design and crisp copper finish of the Hammered Copper Serveware Collection by Thirstystone offers fresh, en vogue style for your kitchen or dining space. The faux marble handles and sleek copper-tone spoons of this four-piece measuring spoon set by Thirstystone bring functional, high style to your kitchen space. 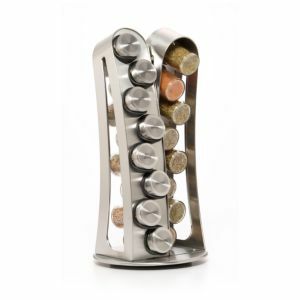 Kitchen essentials become modern art in this sculptural spice rack from Kamenstein. Spices include: Italian Seasoning, Oregano, Pizza Seasoning, Rosemary, Herbes De Provence, Sea Salt, Basil, Celery Salt, Crushed Mint, Marjoram, Parsley, Chives, Chopped Bay Leaves, Coriander Seed, Fennel Seed, and Season Salt. A charmingly classic look, this set from Corningware includes measuring bowls in the most-used dimensions. The iconic cornflower motif celebrates the company's 60th anniversary Stainless steel paper towel holder. Approximately 6"Dia. x 12.5"T. Designed by Alfredo Haberli.